Eau Gallie celebrates with the championship trophy, and Palm Bay celebrates with the runners-up trophy at the 25th Annual Palm Bay Spring Break Tournament. 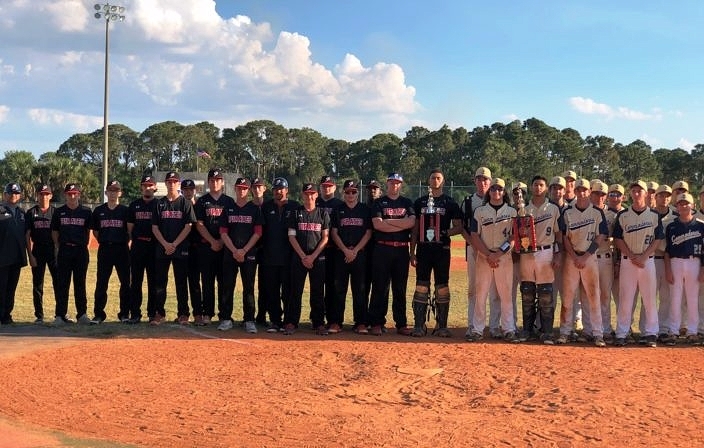 Grayson Joyner helped lift Eau Gallie to victory with a crucial home run that accounted for the winning runs, as the Commodores rallied back to victory in the top of the sixth inning for a 5-2 win over Palm Bay in the 25th Annual Palm Bay Spring Break Tournament on Wednesday. Palm Bay had held on with a slim 2-1 edge most of the way, before Joyner’s second homer of the day put his team back ahead for good. Joyner also handed his team an early lead with a solo home run in the second. With opportunities running out, the Commodores (11-5) got it going with one out in the sixth. Ian Kalman singled past the shortstop to put the tying run on, and Joyner changed the entire outcome when he jumped on a 1-1 offering for a two-run blast to left. With all the momentum now on their side, the Commodores added two more insurance runs. Colby Velasquez singled and Trey Jackson walked, and Brock Losee ripped a single through the left side that drove in both runners. The close battle between the two district rivals culminated an exciting tournament for the ages. Seven of the nine games were decided by one run, with three walk-off decisions, and the finalists came in after having split their two meetings in the regular season. The Pirates (10-9) were fresh off an 11-inning, walk-off victory the day before, and they nearly carried that momentum to a tourney title. After falling behind on Joyner’s first homer, Palm Bay answered back with two runs in the bottom of the third. Isaiah Schier walked, James Mahoney singled and Elijiah Roberts advanced them both into scoring position with a sacrifice bunt. After Eric Garcia was intentionally walked to create a force-out to any base, Simon Bourett delivered an infield single that brought in both runners. But, true to form throughout the tournament, Eau Gallie’s pitching was up to the challenge. Relievers Michael O’Keefe and William Hagen combined for four scoreless innings to close things out. Eau Gallie senior Carter Stewart was named tournament MVP. Carter pitched five-and-a-third scoreless innings with one hit and 13 strikeouts, and also drove in six with three home runs and two doubles offensively.